Vanessa Johnson suffered in silence. A social worker who made many house calls and a mother of five stuck in an abusive relationship, Johnson had her own conflicts she faced at home alone. She grew desperate to escape the affliction of her life and attempted suicide more than 20 years ago, but through the grace of God she lived to share her experience. Vanessa Johnson’s work through Blue Moon 211 has benefited the water-starved people in Flint, Mich. Johnson is a GCU online student who lives in Tampa, Fla.
Three years ago, Johnson felt called to start Blue Moon 211 Inc., a Tampa, Fla., nonprofit focused on suicide prevention and awareness. The origin of the name: Blue is for sadness, Moon is for God’s creations, which we all are, and 211 is synonymous with the nationwide helpline. Clinging to her faith in Christ, Johnson set off on her own with her children and only $50 in her pocket. She never looked back. Johnson, 54, now spends endless hours working while completing her master’s in Christian counseling from Grand Canyon University. “From being a part of radio programs, newspapers, workshops abroad and my training from GCU, everything happened so fast and it’s been a great journey,” she said. 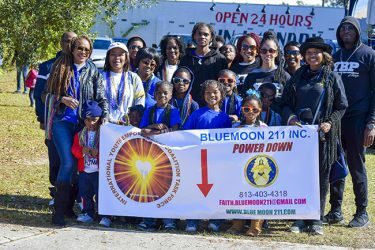 Blue Moon 211 has held workshops and conferences in Florida, Jamaica and Washington, D.C. Most recently, the nonprofit managed to secure a newly signed law to mandate youth suicideprevention training in schools in Florida, effective in August. Johnson has rallied people of all ages in Tampa. And in April, Blue Moon 211 was part of a worldwide effort sending supplies to Flint, Mich., where more than 52 percent of the state is experiencing abnormally dry conditions — there is not enough safe water for drinking, sanitation, irrigation or economic development. Perry Warrior, a community activist and minister in Flint, said he always will be grateful to Blue Moon 211 for contributing to the solution of Flint’s safe-water shortage. A blessing — that’s how Johnson’s enrollment counselor, Zanna Nelson, describes the online student. As president of the International Youth Empowerment Coalition Task Force, Johnson is inspiring youth to help the country move forward without violence. 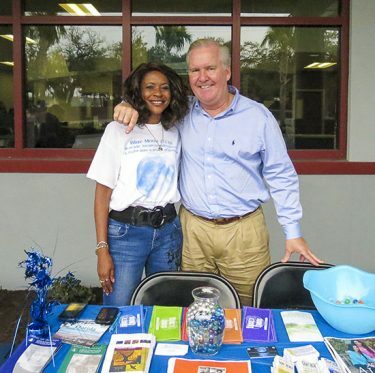 And in her partnership with the Tampa Police Department, she hopes to bridge the gap between police and the community by organizing community events. Johnson with Tampa Mayor Bob Buckhorn. “I was raised in the ’60s when police brutality was a serious issue,” Johnson said. “I’m not saying it’s OK, but what I am saying is that you can always overcome negative feelings of anger and hate with the spirit that God gives you and you can look at people with a different set of eyes. How does Johnson get all of her energy? She makes it clear — God. And she is thankful to have support from faculty at GCU who are upfront about their faith. Johnson also has found fulfillment with a new husband (Johnny) and stepchildren. When she’s not working, she’s encouraging her 11 grandchildren to share their Christianity. Johnson hopes that her efforts will help prepare strong and effective youth, and she is enthusiastic about the future. “GCU helped me understand what I needed to know to go out and do what I do now with confidence and with faith,” Johnson said. Blessings to you, Ms. Johnson. May our Lord and Savior Jesus Christ be with you in every way, and may He also bless you with long-term health, long life and wealth. May God bless your children and family.